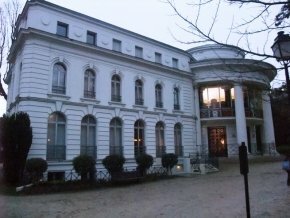 3/2/10 – Acquisitions – Saint-Cloud, Musée des Avelines – While many small museums today face serious financial difficulties, others, on the contrary and fortunately for the pleasure of all, can afford to develop and encourage the activities they offer, even to increase their holdings. This is the case notably for the Musée des Avelines in Saint Cloud, outside of Paris, which opened in 1988 in the former villa belonging to the collector Daniel Brunet. 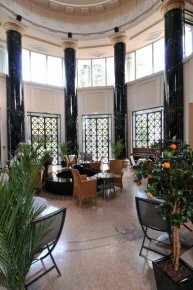 The residence was built between 1928 and 1935 by the architect Louis Mourot in a subdued Art Déco style, strongly influenced by classical architecture (ill. 1). 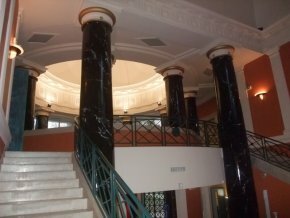 The museum closed from May until November 2009 to restore its central atrium (or rotunda) which presents a glass ceiling held by large Doric columns (ill. 2 and 3). The museum collections illustrate the history of the city of Saint Cloud and its domain, from the 17th to the 20th century. 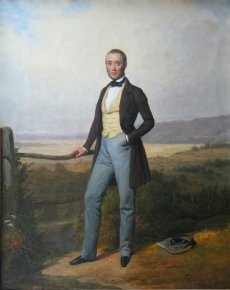 Recently, several works joined the holdings including three paintings by Pierre Duval Le Camus. 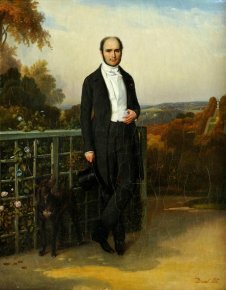 A Portrait of a Man Standing in the Park of Saint Cloud (ill. 4), undated, purchased in 2008 from the Chantal Grangé Gallery and the Portraits of Madame and Monsieur Fontaine de Bonnerive (ill. 5 and 6), acquired a year later from Etienne Breton. Pierre Duval Le Camus, born in Lisieux, was a student of David and specialized in genre scenes as well as portraits. He was elected mayor of Saint Cloud in 1853, a year before dying in this same city. These three works, of practically the same size, are typical of his art : small portraits, in a polished, smooth manner reminiscent of Northern painting, in the tradition close to that of Marguerite Gérard or Louis-Léopold Boilly. The representations of models standing against a landscape recall those of English painting. The museum will present a retrospective highlighting Pierre Duval Le Camus and his son, Jules-Alexandre, a history painter who did the works for the choir inside the church of Saint-Clodoald in Saint Cloud, from 8 April to 4 July of this year. 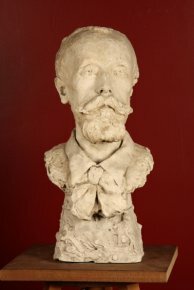 In 2009, a plaster bust by Caroline Benediks-Bruce (ill. 7) representing the painter Edouard Dantan, a native of Saint Cloud, was bequeathed to the museum  by Madame Logeard, Dantan’s granddaughter. Caroline Benediks-Bruce, born in Stockholm in 1856, studied at the Royal Arts Academy of Sweden before coming to Paris in the early 1880’s where she attended the workshop of Alexandre Falguière. She returned to Sweden in 1899 with her husband, the Canadian painter William Blair Bruce. The style of the Dantan bust has a strong resemblance to the work of Jean-Baptiste Carpeaux. 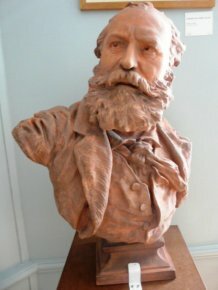 In a lucky coincidence, a year ealier in 2008, a terra-cotta bust of Charles Gounod by Carpeaux himself (ill. 8) had been donated by the Boulart-Baignières family. There are several known versions of this sculpture as Gounod had commissioned them for his friends. 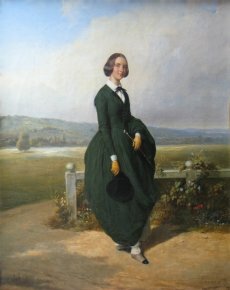 Charles Gounod stayed several times in Saint Cloud at his in-laws’ house before building his own residence where he remained until the end of his life. Two other notable works have also been placed on deposit at the museum. 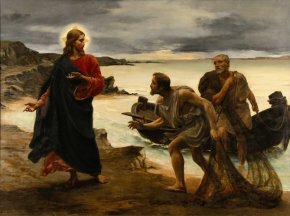 A very beautiful painting by Edouard Dantan, The Vocation of the Apostles Peter and Andrew (ill. 9), which has just been restored, is on temporary exhibition for conservation reasons until the hospital chapel for which it had been painted is refurbished (the work has been decided but no dates planned). 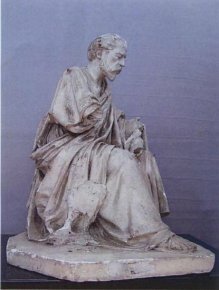 A plaster Saint John the Evangelist (ill. 10) by Ernest Guilbert was found in the attic of the church of Saint Clodoald by Father Aybram, the parish priest, and was restored before being placed on deposit in the museum. 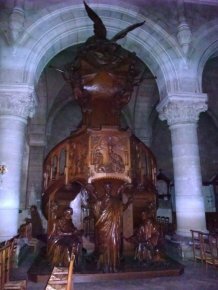 This is a study with a distance scale for one of the figures of the magnificent sculpted wood pulpit of the church of Saint Clodoald (ill. 11), commissioned by the pastor who had launched a fund raising drive for it ; it had been presented at the Exposition Universelle of 1900 before being installed in the church. The bequest also included three Sèvres ceramic pieces from the set of the château of Saint Cloud showing signs of the fire. Previous article in News Items : Before mortgaging the Hôtel de la Marine, restore it to mint condition !